The capital of Santa Catarina State, called “Floripa” in southern Brazil is not as famous as other destinations in Brazil, but it is definitely one of the most beautiful places to go. 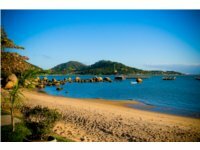 Florianópolis is a place out of a picture book: in addition to more than 42 paradisiacal white sandy beaches you will find sand dunes, about 20 other islands, two major lakes in the middle of the island and the evergreen Atlantic rain forest, often designated as a nature reserve. The city was founded in 1726 wit the name Nossa Senhora do Desterro but during the XIX century the name was change in Florianopolis in honor to Floriano Peixato, Prime Minister, that ended then Federalist Revolution. The brasilian city is famous in all the world for its beaches and is also favourit destination for many surfers from every part, for this reason Florianopolis is one of the location of ASP World Tour of the Association of Surfing Professional. The economy is based, mostly, on technology, tourism and service. After a day of surf is it is possible spent a pleasant night in one of the clubs that are in Florianopolis in front of the sea and try the tipical Brazilian nightlife. In addition there are many restaurants: japanese, italian, arabic, french and obviously the authentic Brazilian barbecue. The architectures of the city (houses, churches and museums) are in colonial style, the Public Market built in 1898 now sales food and handicrafts (jugs, vases, ceramic pots and decorative knic-knacks, tipical of Florianopolis’s culture). Interesting to visit are the pre-colombian rock inscription ore the locatione where was founded the first colonization. The city is very famous for its beaches, the most popular are: Ingleses Beach, Campeche Beach, Joaquina Beach, Barra da Lagoa where, in addition to amazing naturals landscapes, is possible diving, paragliding, raving, hang gliding, mountain biking and, obviously, surfing. Florianopolis is a paradise for shopping: it’s possibile or in one of the many roadside vendors or visite one of the two modern mall (where they sell everything for surfing). Typical brasilian climate where the hottest month is December (+25 C) and the coldest month is August (+16 C). Pleintful precipitation but share during the year. In Florianopolis there is Hercilio Luz International Airport where arrive domestic and international flights and connect the island with other countries. The buses connect the city, towns and villages of Saint Catarina and with the South, South East and Central-West regions of Brazil. Finally there are a project of University of Santa Catarina for planning a cicleway in the city.